Applying small bathroom design ideas and clever home staging tips can make a tiny bath look bigger and more inviting to potential home buyers. 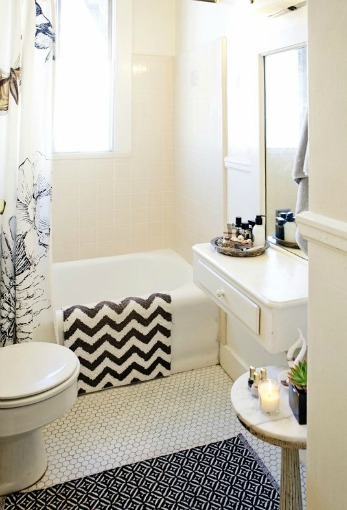 Just because your bathroom is small doesn’t mean you have to sacrifice on storage and style! For most home buyers, bathrooms are one of the most important rooms to consider when buying a house. Many people base their home buying decisions on the size, style, and condition of the main bathroom. Bathroom renovations follow kitchen remodels as the most expensive rooms to renovate in a house, and most home buyers simply would rather buy a move-in ready home. Having a small main bathroom definitely puts you at a disadvantage when competing in the real estate market. Because small bathrooms are often cramped, cluttered, and dysfunctional, many buyers will walk away no matter how great the rest of the house may be. 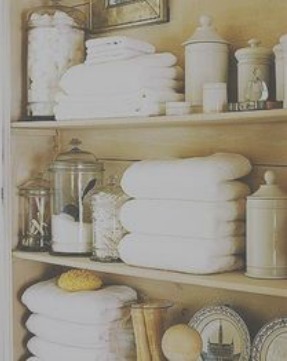 See small bathroom storage solutions. Interior designers say that the eye travels more quickly through a small space. Eliminating things that stop the flow of the eye; clutter, sharp contrasts in color, dark heavy draperies, bulky furniture, and so on, can help to visually expand a small room. Color is the key to all successful decorating— it can create the perception of visually raising and lowering ceilings, stretching or shrinking space, and even making something ugly look pleasing. Color also has the ability to effect our moods, but the greatest asset is that color can be added so cheaply-- a few cans of paint can quickly and drastically improve your home decor! Most people respond positively to light, neutral colors. When preparing to make a home sale, your goal is to make small spaces appear more spacious. Using the right paint colors and color combinations can make your home appeal to a larger number of buyers. ﻿To create the illusion of more space, use neutral or pastel hues as the main palette of your small bathroom. Pale colors reflect and multiply light, and when combined with natural light flowing in, can visually expand a small bathroom. A soft cool color, like aqua blue, is a great choice for expanding space and making a tiny bath feel calm and "spa-like". Cool whites, creams, soft grays, greens and blues, pale colors in general, are receding colors that reflect light, creating a feeling of spaciousness. Accent with shades of white or soft cream to unify the space. Small bathroom design ideas include swathing an entire bathroom in white to create an uninterrupted space without breaks of color contrast to prevent the eye from moving on. Because a too white room can often feel cold and intense, punctuate with spots of color in the towels, shower curtain, window treatments, and accessories. Dark colors absorb and deflect light and can make a small space feel closed in. To create a feeling of maximum space, use the same light color palette on the walls, floors, cabinets, window treatments and trim work. Employ a light hand when adding pops of color, using no more than 2 or 3 colors in a small space. Shorten a long, narrow room with the following color combinations; paint the long walls a light color and the end walls in a darker warm shade of the same color. Because dark colors seem to advance, this will create the effect of "squaring" the room. Choosing a monochromatic color scheme is one of the best small bathroom design ideas you can make. Expand this small space by using several shades of white, beige, or grey, and vary the textures with bathroom fixtures and accessories. A small bathroom will seem larger by painting the walls, trim, doors, and woodwork the same light, neutral color as the walls. This also makes ugly molding appear to blend into the walls, making them less noticeable. Avoid overly bright or dark colors in a small space. If bathroom walls are broken up with doorways, poorly placed windows, nooks, or a slanted ceiling, make them less conspicuous by painting them the same color as the walls. Electrical outlets and switch plates are also a distraction to the eye if they contrast too much with the wall color. Making them the same color as the walls will allow them to blend in and won’t interrupt the flow of the eye. Make unwanted features, such as an ugly radiator or unremarkable moldings less noticeable by painting them the same color as the walls. Doing so will make them less obtrusive by blending them in with the background. The monochromatic, or low-contrast color scheme is the most successful color palette for small room design, because it can visually expand the size of a room. A monochromatic color scheme creates harmony, visual cohesion, and a sense of relaxation in any room. This room design style mixes light to dark color variations in different shades, tints, tones and textures, and is usually accented by white, used in window trim, molding, ceiling, etc. Any color can be used in monochromatic room design, but don't be going all purple shades if you are staging your home for sale! Many people yawn at the idea of a room that is basically designed around one color, but by incorporating variations in tones, textures and accessorizing with glass, objects from nature, greenery, you can create a feeling of spaciousness and sophistication. A monochromatic room design also makes the perfect backdrop for displaying artwork and collections. Don’t be afraid to incorporate pattern and texture into a small bath, just keep them to a minimum. In the absence of wild patterns and bright paint colors, bringing in some texture will add excitement and interest to a small bathroom. Outdated wallpaper should be removed, as home buyers will probably hate it. Too much wallpaper can be overwhelming and will send buyers out the door! As a rule, wallpaper should be avoided when staging your home for sale, unless it's very neutral, or has a vertical or horizontal element that you need to “elongate” the room. See removing wallpaper. Add pattern and texture to your small bathroom with window treatments, accessories, flooring, area rugs, and lighting fixtures. Avoid large or busy patterns that will diminish the scale of the space. If you must use a large pattern, confine it to a small area, like a floor mat. Use fabrics with texture rather than pattern so as not to overwhelm a small space. Texture adds interest when light hits the uneven surfaces, bringing varying degrees of lights and darks of the same color. Lighting fixtures can have texture as well. For instance, polished chrome will be smooth, whereas wrought iron will add a rustic feel. Shiny, satiny fabrics on a shower curtain or window treatments will help illuminate the space. Avoid heavy brocaded fabrics, laces, ruffles, and dark colors in small room design. Use smaller prints or solid color fabrics to create a more unified effect in a small space. Horizontal stripes on the walls, floors, or bathroom tile can elongate and bring movement to a small room. We’ve all heard that saying about wearing horizontal stripes…that it will make you look wider. This applies to home design as well. Vertical stripes on the walls or tile can visually add height to the bathroom. Use wide stripes, as thin ones can make a room feel smaller. Apply a wide vertical pattern or stripes on the wall, to visually "raise" a low ceiling. Avoid "striping" every wall in a tiny bath, as the effect can visually shrink the room. Use neutral paint colors or tile for home staging. A dark wall against a white ceiling can make a small bath feel too enclosed. When walls and ceilings are the same light color, it's harder for your eye to tell where they meet, so the room feels larger. Continue light tones onto the floor by using a light-colored tile or light hardwood flooring. Make a low ceiling appear higher by painting it a cool light receding color, like white or a pale blue. A ceiling that's too high can be visually lowered by painting it darker than the walls. The more flooring that's exposed, the bigger a space will seem, as sight lines are extended. 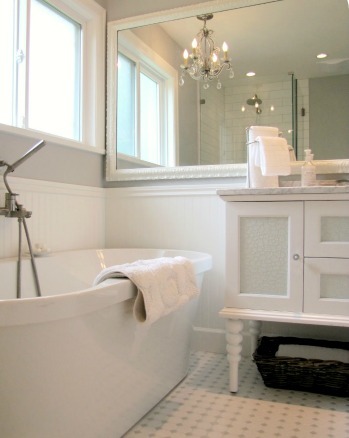 Light colored tiles or hardwood flooring will make a small bath seem more open. 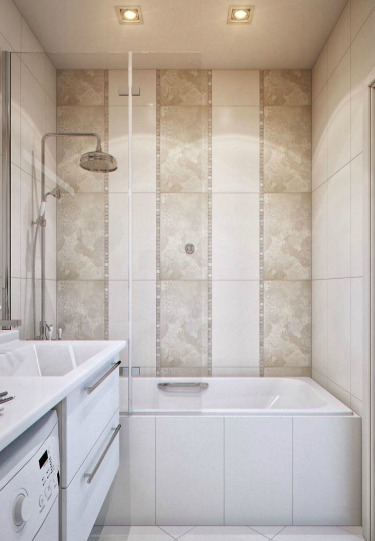 Continue light colored bath/shower wall tiling onto the floor to prevent a visual interruption. A floor with wide stripes can make a room seem longer (or wider) than it is. If home staging, I don’t recommend painting wood flooring with stripes unless they’re very subtle, because it’s just too taste specific. Instead, use a large area rug with wide stripes to lengthen. 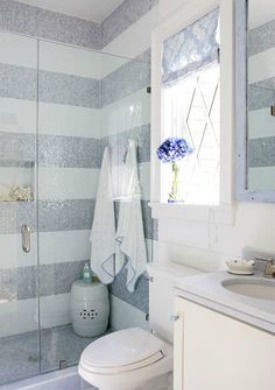 Wide stripes can be incorporated in bathroom floor tile to visually elongate a small room. Avoid scattering too many small rugs in a small bathroom— it will look cluttered. TASTE SPECIFIC: Your specific taste may not appeal to very many people. When selling your home, your goal is to target as many home buyers as possible. Home staging tips help you to achieve this. Poor lighting can make a small bathroom feel like a closet! Unlit corners make a room feel smaller. In extremely small bathrooms, a single overhead fixture may provide ample lighting, just be sure it doesn’t glare. One glaring overhead light fixture can dominate a room, drawing the eye to that one spot. Apply more than one source of light in a small space to keep the eye from fixating. The formula for a shadow-free reflection in the mirror is to combine overhead lighting and a fixture on each side of the mirror. See interior lighting. Natural light flooding into a small bathroom will give a feeling of greater spaciousness. Maximize the natural light that you have by keeping window treatments minimal or simply going without. Heavy or dark window treatments can feel oppressive. For small bathrooms lacking natural light, consider installing a larger window, skylight, solar, or sola tube. A solar tube will brighten the room without sacrificing wall space. They aren't very expensive, ranging from $140 to $300. Solar tubes can be found at Lowes, Home Depot, or www.solatube.com. 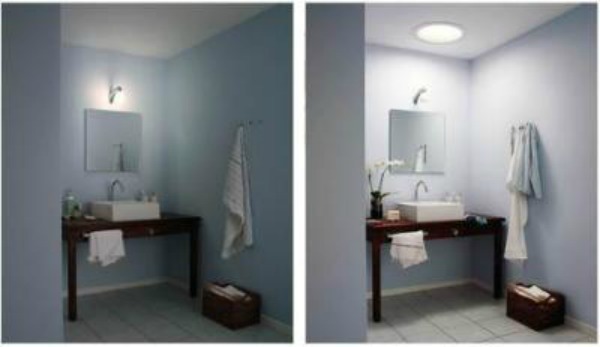 Recessed lighting is a great choice for small bathrooms, especially those with low ceilings. Recessed lighting creates a lovely ambience and will light up dark corners of a small space, making it appear larger then it really is. Stay away from large obstructive lighting fixtures like, drum pendants and large chandeliers, which can overpower a small space. A small sparkly chandelier can be quite charming in a tiny space, though. Install clear light fixtures instead of opaque ones to create longer sight lines. Remember, you don't want to interrupt the eye from flowing. Solid bathroom cabinets can visually weigh down a small bathroom, in addition to taking up precious square footage. Revealing more floor space will make a small space appear larger. Use fewer pieces of furniture instead of a lot of small pieces that crowd the room. One of the best small room design ideas is to use furniture with glass see-through tops, open-legs, or clear lucite pieces that will extend sight lines. Replace cabinet door fronts with glass. Your eye will be pulled into the cabinets to the back, making the room feel deeper. Avoid using dark colored glass and keep cabinet interiors uncluttered. This glass cabinet home staging tip only works if you keep the insides neatly staged. 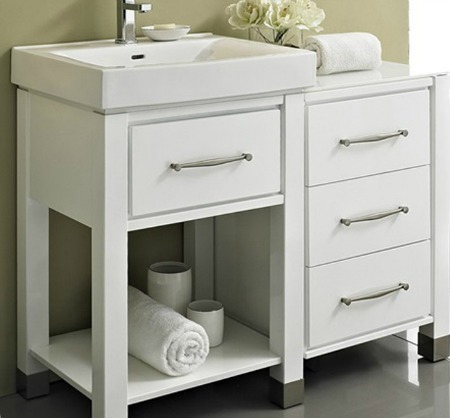 If storage isn’t an issue, swap out bathroom cabinets with a pedestal or wall mounted sink. Both styles can be squeezed into a smaller space, like a corner, freeing up more floor space. There is a trade off, though, because home buyers LOVE storage. 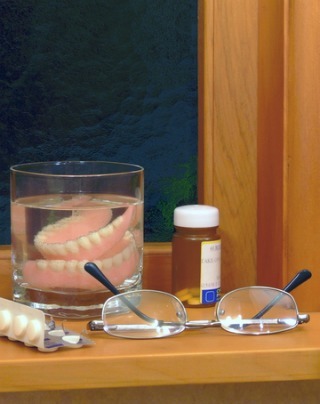 You have to weigh the risk of sacrificing storage against esthetics. Use a wall-hung vanity and toilet rather than the styles that sit on the floor. Install an open-leg style sink with built-in towel bars rather than using up precious wall space. Under mount sink basins take up less space on a countertop then top-mounted and modern bowl style basins. 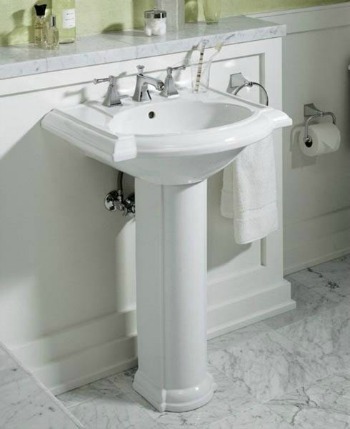 Oval-shaped basins take up less room than square ones. If you install a bowl style basin, opt for a see-through version to extend sight lines. A corner sink, with, or without a vanity will make the most of limited space. Install open shelving instead of hanging cabinets for extra storage. Open shelving reduces visual weight and adds extra depth by allowing your eye to travel all the way to the wall. Keep the shelving narrow so that it doesn’t protrude too far into the room. Glass shelves increase a room's sense of space because they can appear invisible. Items placed on them seem to float in space. When accessorizing open shelves, keep plenty of space around objects. This will create some breathing room, which translates to that open, airy feeling. Focus on using just a few standout accessories instead of a collection of small objects, which can look cluttered. Great home staging diy tips to keep the eye moving is to decorate the shelves with objects the same color as the wall behind them. Create more height by accessorizing shelves with tall objects. 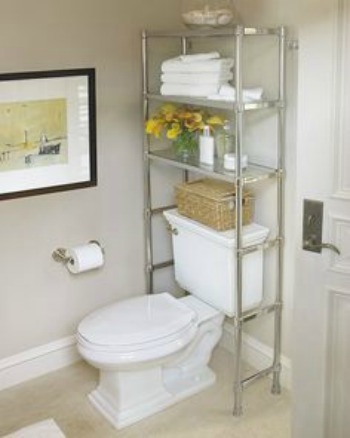 Gain storage by placing an over-the-toilet shelving unit or shelf over the toilet or on a window sill. Avoid over-accessorizing these areas. 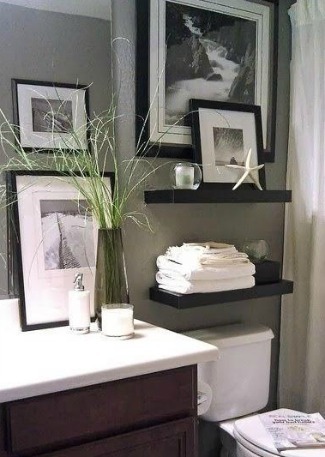 For more storage ideas, go to small bathroom storage solutions. Mirrors are one of a home stager’s favorite interior decorating tricks, because they visually enlarge a small room by adding depth and light. Mirrors give the impression of extending space by duplicating it. Hang a mirror opposite a window with a good view or a lighting fixture to scatter and bounce light around the room. Or position two mirrors opposite each other— this will make it look like another room exists in the small space. When staging your home for sale, avoid hanging a collage of too many small mirrors, which looks cluttered. Avoid plastering an entire wall with a large glued-on mirror. While this is a really effective way to make a room look larger, most home buyers don’t like them, and will be thinking of all the work it will take to get rid of them. Another home staging tip is to lean an oversized floor mirror against a wall. Do this only if room permits, as you don't want to be tripping over it! See leaning pictures and mirrors. 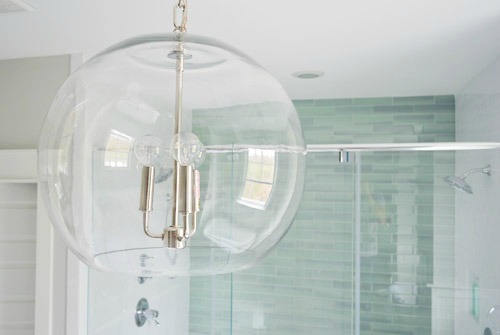 Reflective surfaces, like glass tile, sleek cabinets, and shiny hardwood floors, will illuminate your bathroom by amplifying the natural and artificial light, making the bath seem larger. Light colored bathroom tiles will reflect light and add a feeling of openness. 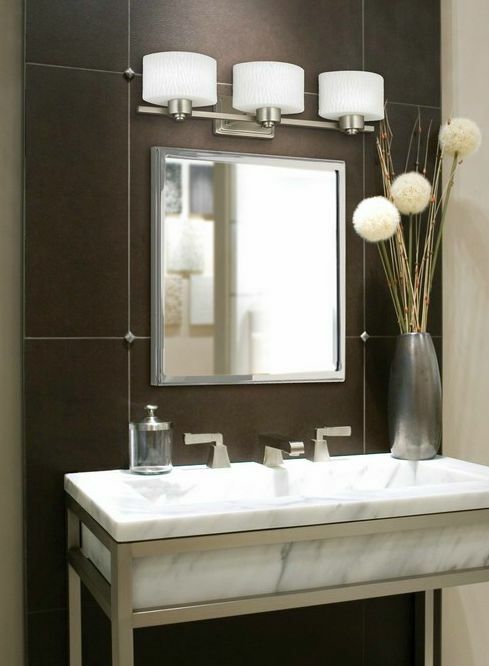 Choose shiny bathroom fixtures for their reflective qualities. Make sure they all match—stick to one type of metal finish throughout the bathroom. Fixtures should be kept simple and compact in a tiny bathroom. 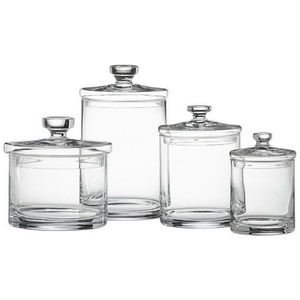 Store necessities in glass or reflective containers—they will look light and airy in a small bathroom. This is the best tip for enlarging a small bathroom! 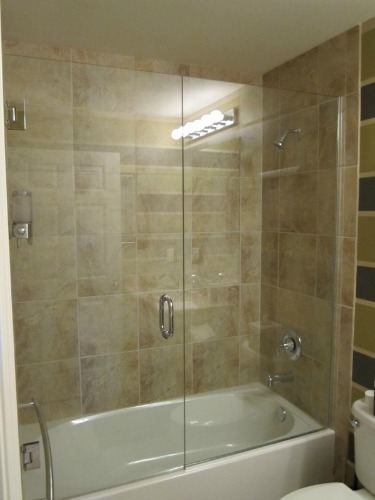 Replace a shower curtain or frosted-glass shower doors with clear glass shower doors. Installing frameless shower doors will give you the illusion of even more space in a small bathroom. Consider getting rid of the tub entirely and just going with a shower in a small space. 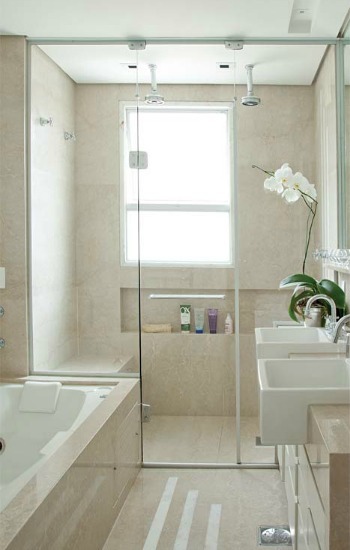 If a glass shower door is not in your future, stage the shower/bath with the shower curtain 2/3 open. Keeping the shower curtain closed blocks all that extra space, and your bathroom size will be cut in half! No matter their size or style, windows enlarge the feel of a room if natural light is allowed to flow in. If privacy is not an issue, simply leave windows unadorned. 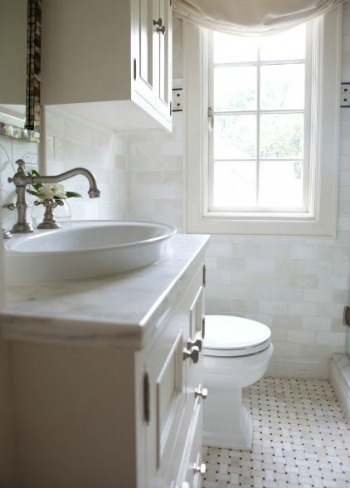 Keep tiny bathroom window treatments the same color as the walls to avoid contrast to the space. Avoid complicated details such as ruffles, lace, and bows for window treatments. A lot of “fussiness” can make a small space feel stuffy and closed-in. Use simple valances, window blinds or shades—aim for a clean contemporary look. One of the best small bathroom design ideas for low ceilings is to install curtain rods higher than the window frame, even up to the ceiling. Hanging long window curtains to the floor will create a strong vertical line that draws the eye upward. Create the illusion of wider windows by extending the curtain rods well beyond the width of the window, wide enough so that curtain panels don't cover any glass when fully opened. This will allow more natural light into the room. See window treatments for home staging tips. Home buyer turnoff! Hide personal items away. 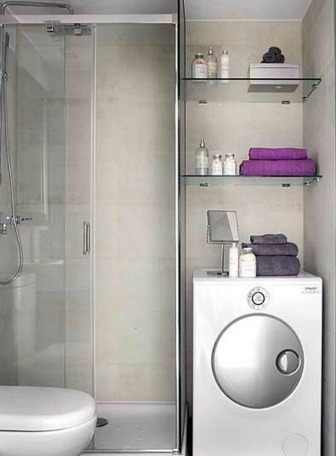 A clean, tidy bathroom always looks larger and more spacious than a cluttered, dirty one. Home buyers don’t want to see other people’s personal items all lined up on the bathroom counter. It makes it hard for them to visualize themselves in your home. See depersonalizing your home. Hide all daily essentials such as, makeup, toothpaste and brushes, prescription pills, by stashing them inside a linen closet, the bathroom cabinets, or inside attractive boxes and baskets displayed on open shelving. Don't leave wet towels or your favorite ratty bathrobe hanging on the back of the door. This is the last phase in home staging your small bathroom! Hang a new contemporary shower curtain and coordinating towels; fill baskets with pretty soaps or rolled towels; stage your bathroom with objects from nature, candles, window treatments, mirrors and artwork. See staging the bathroom. Establish a focal point if your don’t have one. It’s okay to have at least one element that is somewhat bold in a small space. It could be a piece of artwork, a mirror, maybe a stunning light fixture. If you have a great view, use this as your focal point. Arrange accessories in odd numbers as this creates a more relaxed feeling. See art of accessorizing. Group smaller pieces of artwork together so they read as “one” piece, or a unit. Not too many pieces, though, as they will be viewed as clutter. See how to make a vignette. Limit collectibles to one or two favorite pieces, or allow one outstanding accessory to become a focal point. Instead of an arrangement of flowers, display a single elegant bloom, like an orchid. Use accessories with reflective or see-through qualities that will blend into the background, like glass jars and canisters. Avoid hanging large pieces of art with heavy ornamental frames, as they can overpower a small room. Large artwork is fine, just make sure picture frames aren’t bulky. Small bathroom design ideas that really work-- hang framed pictures of landscapes, or artwork that feels like you're looking through a window. Any kind of artwork that has visual perspective will seemingly add depth to the room. If your small bath has shelving, don’t cram them completely full. 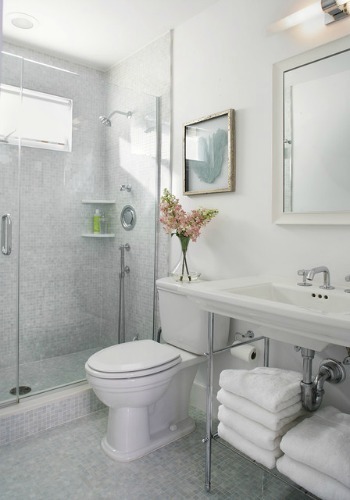 Allow breathing space between objects to give your small bathroom an open look. All metal finishes, (faucets, tub and shower fixtures, and towel bars ) should match. Keep light fixtures in the same metal tones as well. 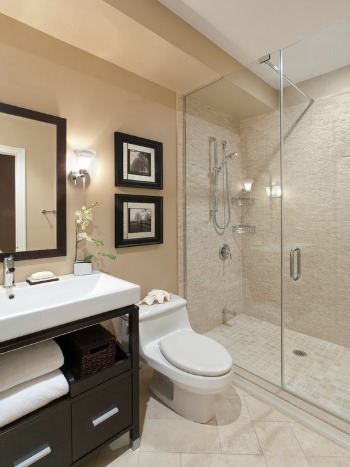 Keep the floors clear to maximize the square footage of the bathroom. Remove the garbage can for home viewings.